• Robust and amenable to HTS: Assay can tolerate up to 300 μM ATP and 10% dimethylsulfoxide (DMSO). Z’ factors of > 0.6 are routinely observed in 96/384-well plates. Can be readily automated on HTS liquid handling systems for tens of thousands of assays per day. Kinases , also known as phosphotransferases, constitute a large family of enzymes that transfer phosphate groups from the high-energy donor molecule ATP, to their specific substrates. Kinases are known to regulate the majority of cellular processes. The largest group of this family is the protein kinases. So far, 518 different kinases have been identified in humans and up to 30% of human proteins are modified by these kinases. The enormous diversity and their key role in cellular signaling make them ideal targets for drug developments. 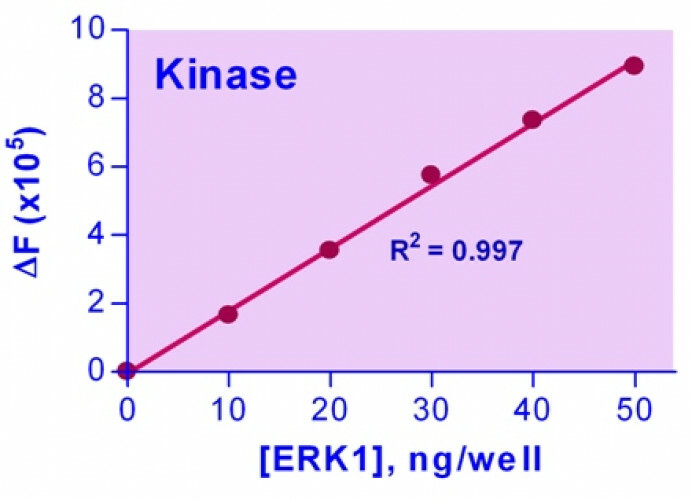 BioAssay Systems’ EnzyChrom™ Kinase Assay Kit provides a simple and rapid method for assaying kinase activity and high-throughput screening for kinase inhibitors. This homogeneous microplate-based assay involves incubating the kinase with a single working reagent, in which ADP is enzymatically converted to ATP and pyruvate, which is quantified using a fluorimetric (530nm/590nm) assay method. Applications Rapid homogenous assay for protein kinase activity and high-throughput screen for kinase inhibitors. 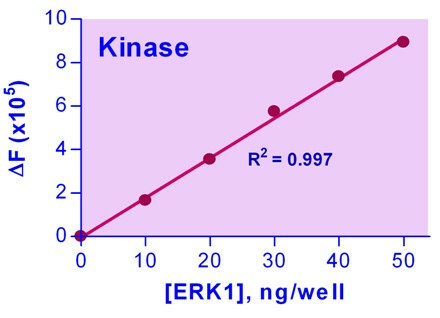 References Assay: Kinase in Human enzymes (Pubmed).